Canada must be strategic if it is to meet its conservation commitments, according to a recent study. That means moving quickly to protect land with high ecological value. Developed by 17 independent researchers in fields ranging from fisheries management to environmental law, the study, published earlier this month in the journal Facets, outlines a science-driven approach for identifying geographic locations that best match conservation goals. The study outlines five distinct conservation goals: protecting species at risk of extinction, representing Canada’s rich and diverse ecosystems, preserving intact wilderness, ensuring that wildlife can move freely and safely between protected and unprotected lands, and safeguarding areas that are resilient to climate change. Using these five principles, the team devised a preliminary framework that could help identify areas with the greatest ecological potential. By pinpointing areas with the greatest amount of endangered species, diverse ecosystems, intact wilderness, effective connectivity and resilience to climate change, and comparing them to existing protected areas, the researchers were able to identify gaps in current conservation efforts across the country and zero in on priority areas for protection. The research is “a really important stepping stone” on the journey to reaching Canada’s conservation target, says Aerin L. Jacob, an ecologist and one of the study’s lead authors. According to Jacob, what needs to follow is a more rigorous plan that involves the extensive engagement of government, relevant stakeholders and local communities. To spark that engagement, the researchers developed an interactive planning tool that presents the data in a user-friendly format. “There are a lot of stakeholder groups that really want to help, that really want to plan, but many of them don’t have the technical expertise and the data,” says Richard Schuster, a conservation biologist who led the development of the application. The tool will help users visualize gaps and opportunities and in turn, set their own conservation goals. 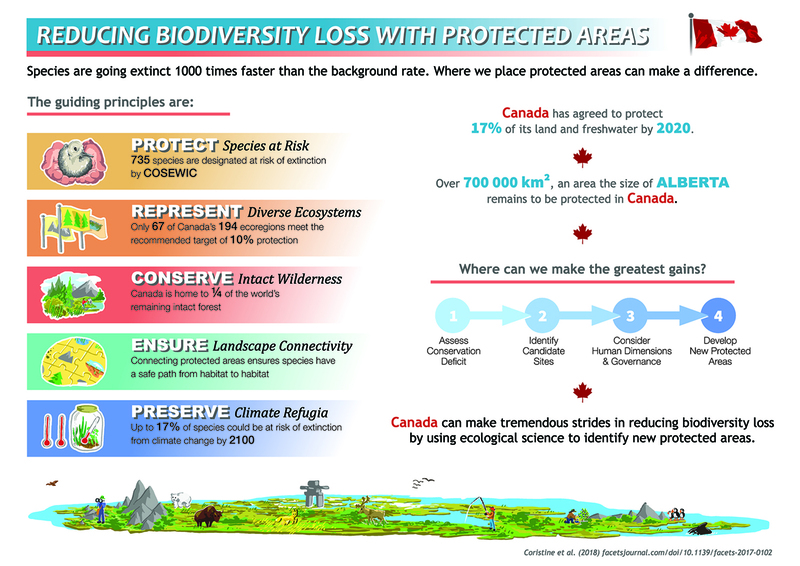 Moving forward, the study authors say the conversation about protected areas must address what exactly the government and the public want to see protected in Canada. The framework doesn’t prioritize any of the five conservation goals—instead, they want Canadians to use their data and set their own priorities. Coristine says Canadians need to first and foremost understand why conservation is important.